2. Bottles. Since I couldn't nurse my son during the day, he needed to be bottle-fed. I tried at least five bottles until we hit on one that my son liked—and we stuck with it until he graduated to a sippy cup around his first birthday. My bottle warmer had a permanent place on the kitchen counter for my son's first year—my husband used it to warm bottles on the week days he cared for our son. And on the days my son went to day care, I sent four bottles with him, which meant I was washing four bottles (and all their tiny parts!) every night. My bottle drying rack helped keep all the clean parts in one place—and easy to find on rushed weekday mornings! I also had a basket for the top rack of the dishwasher to hold small parts that needed an extra good cleaning. 3. A bouncy seat. 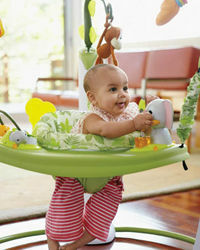 Or exersaucer. Or swing. Getting ready for work is way easier when you can put your baby someplace safe and secure for the 15 minutes you need to take a shower in the morning. In my son's case, if that said place also vibrated—like his favorite bouncy seat—even better. 5. My all-time favorite working mom essential? The picture frame on my desk that holds a photo of my son and husband. It sits right under my wall calendar, which I look at umpteenth times a day, and it's a constant reminder that while I like what I do, I love my boys most of all. As a working mom, what gear is a must-have for you?